As both a reminder and confirmation of the final details, the first special advance screening of our documentary film, Gameplay: The Story of the Videogame Revolution, at The Northwest Pinball and Arcade Show, will be on Saturday, June 7, 2014, from 8 - 10 PM in Seminar Room 316, and will be hosted by our talented director, Richard Goldgewicht, who will take part in a question and answer session following the showing. We look forward to the response for our first public screening of the feature film. We'll also continue to keep everyone updated as further screening and broadcast dates are revealed in the coming months. Be sure to help us spread the word and thanks as always for the fantastic support and enthusiasm around this project! As we start to prepare for the new Armchair Arcade Website, I wanted to take a moment to look back and share a quick visual summary of sorts of the major book, film, and course projects Christina and I have completed to date and were published/went live over roughly the past six years. While I sometimes feel like my promotional efforts are sometimes a bit much - and I'm sure a few of you out there have grown tired of it all by now - I'd like to point out the simple fact that that's the only advertising or direct requests for money, funding, or support we've ever really had for Armchair Arcade and all we ever really plan to have (and obviously this works in conjunction with the Amazon affiliate links). By supporting these projects with purchases, reviews (particularly on Amazon! ), etc., that not only allows us to keep Armchair Arcade (aka, "that site that's been around since 2003") running, but also helps to keep us producing those same types of projects for various publishers and related entities (i.e., they know there's interest in this stuff out there). You can see a link to all our books, here, our film's Website, here, and Christina's Medical Writing course, here. As always, we sincerely thank everyone for their support and look forward to you joining us when we unveil what will be the third major revision of Armchair Arcade since its initial launch more than a decade ago, which will make commenting on and sharing content far superior to anything we've done in the past. Thank you. The legendary CGE to play host to an exclusive screening of our film, Gameplay! Gameplay CGEI'm pleased to announce that Gameplay: The Story of the Videogame Revolution's second exclusive screening has been lined up, this time at the legendary Classic Gaming Expo (CGE) event in Las Vegas. The event will be held at the Riviera Hotel and Casino, located on the famous Las Vegas Strip, from September 12-14, 2014. When we have details on the exact date and time of the actual screening, we'll post an update. For those who don't know, CGE is the original retro gaming expo, 15 years in the running, and promises to deliver a gamer's dream from the 1960's classics to today's hottest products, making it an ideal venue for our film. The events and happenings at CGE are extensive, but don't take my word for it. Instead, check out their Website. Finally, don't forget that our first screening will take place at The Northwest Pinball & Arcade Show! from June 6-8, 2014. You can read more about that screening by clicking here. As always, you can check out this news and more information on the film at its official Website, here, or on Facebook or Google+. Enjoy! The Website for the film, Gameplay: The Story of the Videogame Revolution, is now live! I'm happy to announce that the Website for our documentary film, Gameplay: The Story of the Videogame Revolution, is now live. You can check it out at www.gameplaymovie.com. While the Website is still partially a work-in-progress and we'll be making several tweaks and edits over the next few days, I'm glad that it's now available to share additional details beyond the previously released trailer and movie poster. Don't forget that the film also has a Facebook and Google+ presence, so you can keep track of the goings on at those places or right here at Armchair Arcade, with all of the news consolidated here. Gameplay: The Story of the Videogame Revolution will have its first screening at the The Northwest Pinball & Arcade Show! (their Website) on Saturday, June 7, 2014. Other major screenings are being planned, as well as formal distribution. Enjoy and let us know what you think! The trailer for Gameplay: The Story of the Videogame Revolution is out! I'm thrilled to announce that the trailer for the film I helped write and produce, Gameplay: The Story of the Videogame Revolution, is now out. The film covers the history of videogames and includes exclusive interviews with some of the industry's biggest names. Don't forget, Gameplay will have its world premiere screening at The Northwest Pinball & Arcade Show!, which takes place from June 6-8, 2014, at the Greater Tacoma Convention & Trade Center in Tacoma, Washington. More screenings and distribution details to follow. Let us know what you think of the trailer! Gameplay: The Story of the Videogame Revolution from Tom Coleman on Vimeo. 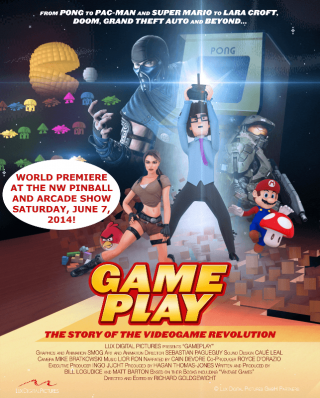 Special advance screening of our Gameplay documentary will be at the NW Pinball and Arcade Show in Tacoma, WA, June 7, 2014! "From Pong to Pac-Man and Super Mario to Lara Croft, Doom, Grand Theft Auto and beyond… announcing the brand new feature documentary about the history of video games entitled Gameplay: The Story of the Videogame Revolution. This film will have a special advance screening at the Northwest Pinball and Arcade Show 2014, one showing only, on Saturday June 7 at 8pm. The documentary is the story of how an idea in 1972 changed the way the world plays games, forever. Be a part of the journey as you witness the birth of the arcade game, and then ride along with the many amazing individuals who harnessed the art and technology, evolving it to new levels. The film features never-before-seen interviews with Nolan Bushnell, David Crane, Noah Falstein, John Romero, Todd Howard and many more. See the changes for yourself, as video games evolve from “User Friendly” to “Lifestyle.” It’s a roller coaster ride through the decades, with many stories of success and failure that you will witness firsthand. Don’t miss out on being the first in the world to see this true film experience of how video games have shaped society. When the credits roll, you’ll be left pondering where the future of video games will journey to next. The Northwest Pinball & Arcade Show! takes place from June 6-8, 2014, at the Greater Tacoma Convention & Trade Center in Tacoma, WA." Thanks to the efforts of Carl Williams and his Scenic 7 PR, we were able to get in touch with and set up an interview with the legendary Nolan Bushnell, for our upcoming feature film documentary, Gameplay: The Story of the Videogame Revolution. While it was a toss-up whether or not Nolan would appear closer to where Matt or I lived first in his travels, it turned out that it was near my neck of the woods, and we were able to conduct the interview today, Father's Day, in New York City. We had a great camera person on the remote shoot, and I had the pleasure of getting additional invaluable assistance from our own Christina Loguidice, both prior to and during my interview. Nolan was a true professional and provided many great sound bites we'll be able to use throughout the film. Added to the other industry celebrities we already interviewed, a great script, and compelling clips, the film is truly coming together as we gear up for a 2011 release. Be sure to stay tuned to Armchair Arcade for all the latest updates on our progress!